Lauren Goodger embarks on the Dr Leah Bare Face By Summer Skin Transformation! Lauren Goodger is one of the first celebrities to undergo this transformative regime and we are delighted she has chosen to put her skin in the hands of our Cosmetic Skin expert Dr Leah Totton. Through completing the Dr Leah 12 week skin transformation Lauren will transform and rejuvenate her complexion achieving flawless skin and enabling her to go make-up free this summer. So what does the Dr Leah Skin transformation programme involve? The programme is designed to improve sun damage, remove skin blemishes, treat red marks, improve scarring, correct uneven skin tone and give an overall flawless complexion. This is a 12-week programme costing £900 and involves prescription strength home care creams which are used alongside three laser treatments using Dr Leah Medical grade lasers. Tell me more about the treatment? Obagi medical strength homecare products - A complete home skincare regimen specifically formulated with 4% hydroquinone to reduce pigmentation and other essential ingredients to brighten and treat signs of skin aging caused by photo-ageing. It also helps to reduce breakouts. The Medical grade Laser uses short impulse light to treat any pigmentation or redness and give an even and glowing skin tone. Lauren Goodger commented “I am doing the "Bare-faced By Summer" skin transformation with @dr_leah_clinics. After years of not looking after my skin, using sun beds and hiding my skin under makeup I am now transforming my skin to get a flawless complexion and go make up free this summer! My transformation starts today (1st March) with Dr Leah’s in clinic treatment and home creams to remove sun damage and blemishes. I will be revealing all on 1st June”. To find out more about how Dr Leah clinics can help you achieve flawless skin please call: 020 7877 5999 or email info@drleah.co.uk to book in for FREE consultation with one of our expert team who can assess your suitability for this transformation programme and start you on your journey to flawless skin. Broken Blood Vessels: What Causes Them, and How Can They Be Treated? Broken blood vessels and redness on the skin are a part of life that many people have to deal with – especially as they age or if they suffer from inflammatory skin disorders such as rosacea. The technical term for these broken blood vessels on the face is telangiectasia – but they can also be referred to as thread veins, spider veins, broken capillaries, or simply redness. These broken blood vessels are tiny capillaries near the skin’s surface that have broken after being overworked and dilating too much. Look closely at your face and you may see them – they typically appear around the chin, nose and cheeks. Unfortunately, once broken blood vessels appear, it can be very difficult to get rid of them. What can cause broken blood vessels? So, what can be done to treat broken blood vessels? Remember that prevention is always better than cure. So, take a look at what you can change in your lifestyle to prevent broken capillaries occurring in the first place, and always ensure that you are daily slapping on adequate broad spectrum SPF 30 suncream to protect from damaging UV rays. However, you can never completely prevent these broken veins from appearing – and some people already have many present. This is where we at the Dr Leah Clinic can help you. To tackle the issue of broken blood vessels, we offer the latest and most up-to-date AFT technology; this is a fourth generation IPL laser treatment that penetrates deep into the skin, shattering and destroying the broken capillaries. These broken capillaries are then removed by the body’s lymphatic system, leaving a more clear and flawless complexion. 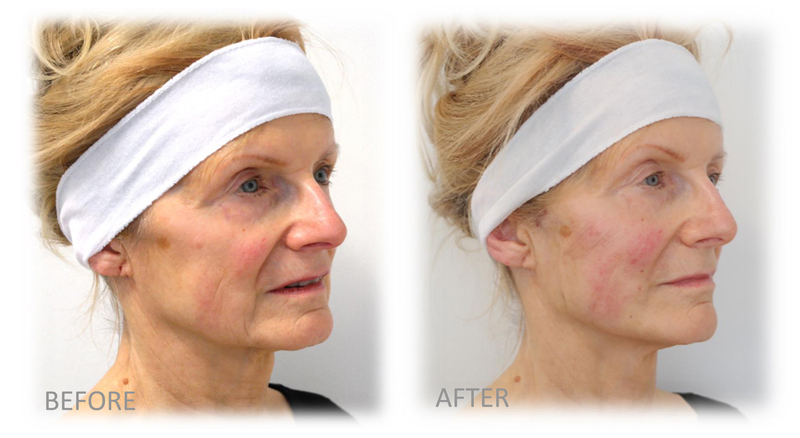 This powerful and effective laser treatment takes just 30 minutes, and does not either require anaesthetic or, unlike traditional ablative laser resurfacing, burn the skin's outer layer. As a result, redness and downtime are minimised. We usually recommend 3 treatments at 4 week intervals. We also recommend, to complement your skin health, gentle home care products containing key soothing ingredients to help minimise redness and strengthen capillary walls. If you want to get rid of those thread veins and redness for good, contact us now to take advantage of our February offer. Purchase 2 laser rejuvenation treatments and receive the 3rd FREE – worth up to £250. This offer is especially useful given that 3 treatments are usually required for the optimum results. Hyperpigmentation can be referred to by many different names including dark spots, age spots, sun spots or just simply uneven skin tone. Regardless of how you refer to this complex skin condition, one thing remains the same - most people who suffer from hyperpigmentation want to reduce or remove it and some are not even sure how it got there in the first place. The signs of hyperpigmentation are certainly easy to spot - they're those brownish patches that give you an uneven skin tone and become more numerous as you get older. Such dark spots can appear on the face as well as on the hands, shoulders and décolletage, there are many different causes of this common skin concern but the most common are sun exposure, hormones or inflammation. The sun’s rays penetrate your skin and stimulate your pigment cells, which are called melanocytes, to produce the pigment known as melanin. This is the skins way of protecting itself from harmful UV rays that can cause damage to cells and even lead to cancer. However, with over exposure to UV these melanocytes go into overdrive and start to produce too much pigment (melanin) which results in an uneven, mottled appearance on the surface of the skin. Such spots can surface seemingly out of nowhere, although they aren't necessarily as random as may first appear, it is the accumulation of damage from the UV to the melanocyte over many years that eventually leads to dark spots being visible on the skin. It can take as long as 20 years for this damage to take place, which is why most people start to notice them later 30’s, a broad spectrum SPF 30 should be worn daily all year round to prevent this. Worryingly, there is an increase in people much younger concerned with dark spots, this is due to over exposure to sun without adequate protection in the quest for the perfect tan or over use of sunbeds. Luckily pigmentation caused from UV tends to be the easiest to treat. Hormones can wreak havoc with our skin, especially when they fluctuate and change dramatically. This is usually due to factors such as pregnancy, menopause or even severe levels of stress. Change in hormone levels can cause the melanocytes in our skin to become overactive. One example is Melasma or “the mask of pregnancy” as it is sometimes known. This is when pregnant women experience darkening of their skin across their cheeks, forehead and upper lip due to the surge of hormones in their body. Their skin can return to normal once their hormones settle but often they will require treatment to clear it completely, especially if they have been exposed to the sun at the same time. There are other common potential causes of hyperpigmentationsuch as inflammation and such dark spots are usually harmless, being undesirable from a cosmetic rather than medical standpoint. Rarely, serious conditions like Addison's disease, haemochromatosis and Melanoma (Skin Cancer) – can be the cause and in particular if a mole appears to change in colour, size and texture we would always recommend seeking medical advice. Recent years have seen the emergence of over-the-counter serums for hyperpigmentation. However, the reality is that unless you are using prescription only based ingredients such as hydroquinone in a safe and tested formula like Obagi the results are going to be minimal. OTC serums are great to brighten and smooth the skin, especially if they include ingredients such as Lactic Acid and Vitamin C. However, these ingredients are not able to penetrate the epidermis far enough to really control the melanocyte and tackle the route of the problem, which leads many people to abandon such products. Using product can often be expensive and timely, which is why many people are looking for an alternative to tackle this hard to treat condition, lasers can be one such solution for fast effective results. Here at the Dr Leah skin clinic, we know a thing or two about this area of treatment, we offer safe, state of the art, FDA approved laser technologies to reduce or completely remove dark blemishes. This pigment busting laser treatment takes just 30 minutes, does not require anaesthetic and unlike traditional ablative laser resurfacing, does not burn the skin's outer layer, thereby minimising redness and downtime. It involves the exposure of a dark spot or pigmented lesion to short pulses of visible light, causing the melanin to shatter and the pigment to be absorbed by the body. The outcome is less visible or even completely destroyed dark patches, leaving you with brighter, clearer and more even skin tone and with it, greater self-confidence. If you want clear, radiant, youthful skin, contact us now to take advantage of our February offer - purchase 2 Laser Rejuvenation treatment and receive the 3rd FREE worth up to £250 - especially useful given that three treatments are usually required for the optimum results. Don't hesitate! Our cosmetic experts here at the Dr Leah skin clinic can help to make 2016 the year of a much better-looking, happier and more confident you. Click here to find out more and book a FREE consultation!